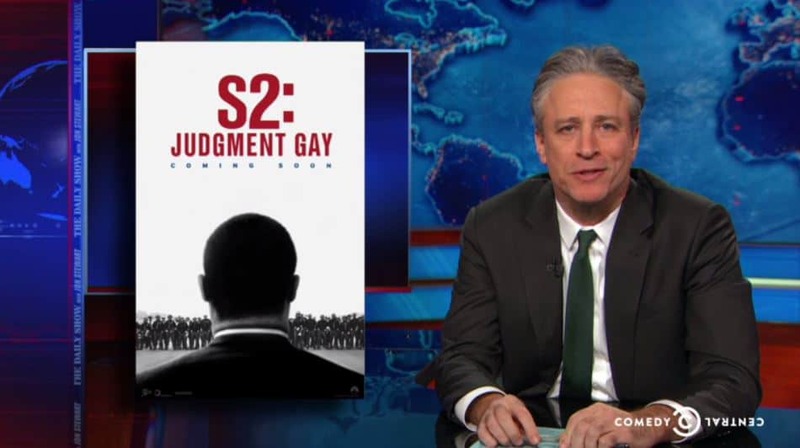 On last night's Daily Show, Jon Stewart took a look at the on-the-ground gay marriage situation in Alabama – including efforts by Chief Justice Roy Moore and certain probate judges to stop marriages from taking place. Stewart also put the spotlight on Kansas Gov. Sam Brownback's executive order removing LGBT protections in the state – with Stewart wondering why Brownback's name hasn't been "Santorumed" yet considering it already sounds pretty much like a sexual word.